Not sure where this topic should go but wanted to start it. 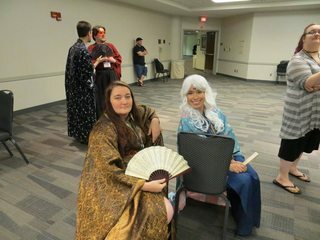 So I and others have been talking about L5R cosplay and coming up with some interesting idea. Do you guys have any experience with or ideas for L5R cosplay? 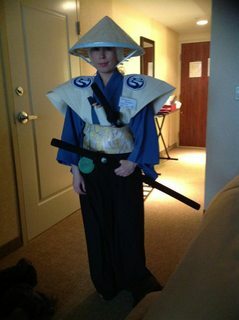 The original forums had a few threads about cosplay we were unable to rescue, but most people just don an appropriately colored kimono and call it a day. When I get home and can access FB from not-a-phone, I can link some pretty awesome images of Doji Yoshi and Kakita Kae cosplaying as Crane samurai. Kakita Shiro wrote: The original forums had a few threads about cosplay we were unable to rescue, but most people just don an appropriately colored kimono and call it a day. We are trying to do our clan justice and have good if not great outfits. Karasu convinced me to do it....so...here's my kimono for Gencon. I'll hem this to 3/4 length, though, so it is more of a long coat. It's cotton. I will wear that over a kimono style T-shirt, like this one. I'll take some kendo hakama and use RIT Dye to dye them, possibly dip dye them if I'm feeling clever. I have a stretch belt that I can use as a cheater obi, which will save a lot of weight and work too. My problems with Cosplay before and why I gave up on it is that it's horribly uncomfortable. Real kimonos are silk (or silk/polyester if you're cheap) and are really, really hot. Add that to an obi over a foot wide, and you can't bend at the waist. Geta are almost necessary for the extra elevation, and then you can't walk. In a gaming setting it's hot and miserable. But this outfit i can make all out of cotton. It should be much more comfortable. 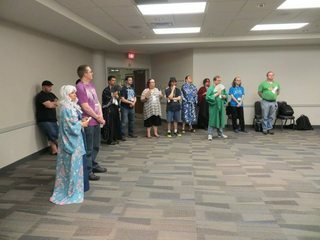 I cosplayed to run my game at my local convention. It just so happened to be purple, so I was able to be Unicorn. It's a cotton Yukata, which I wore over jeans. If you want to purchase a silk kimono or cotton yukata, I suggest going to this site. I have bought a kimono from here and so has my husband, they are very good. They also have jackets and underwear, sort of necessary as kimonos do gape as you move. Bear in mind for men the colours are limited, mostly muted shades of blue, black, grey or brown. Though I guess if you are going to be Crane that isn't much of a problem. To make it, there are the folk wear series of patterns on eBay. There's also men's kimono, kamishimo and hakama patterns. As well as a very authentic simplicity pattern, which I have on order. And I can confirm that silk kimonos are warm! Very, very warm! But the ones they have on the kimonomsite are so lovely. Last tip, and this is from a historical costumer. If you are going to wear all that silk, wear something close to your skin that you can sweat into. Either the kimono undergarments (also on the site) or even just a t-shirt and shorts. This means the sweat doesn't ruin the silk and will save your dry cleaning bill in the long run. And now you know why ladies wore all those undergarments in historical dramas. And if your kimono has gold foil...don't dry clean it. I learned /that/ the hard way. Fortunately it's beautiful without, but....it was even cooler before. I've done at least 3 Crane cosplay over the years. I know that we're magical samuari and not in Japan but, what inspires me for my Crane Clan cosplay are traditional Japanese art, game art, and if whether or not I can get into character in it. Aside from playing the ccg, I played the rpg. 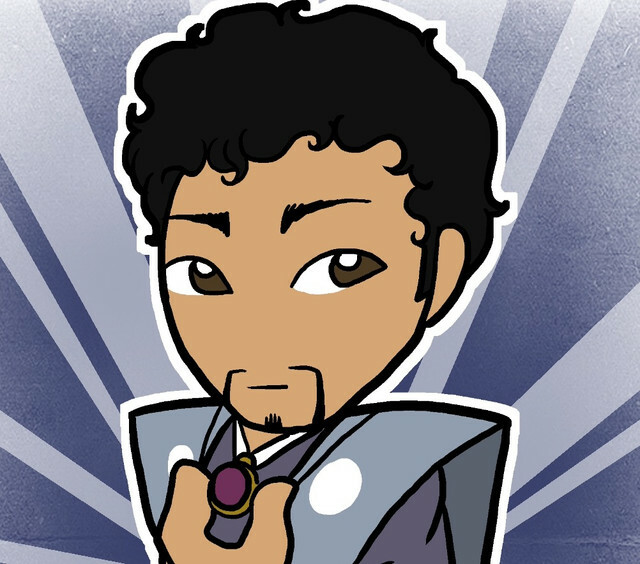 If I can bow and kneel (...and maybe get into a game of Sadane) then it's a go! The pattern of the kimono can determine in which season it should be worn. For example, a pattern with butterflies or cherry blossoms would be worn in spring. Watery designs are common during the summer. A popular autumn motif is the russet leaf of the Japanese maple; for winter, designs may include bamboo, pine trees and plum blossoms. Again, we're not in Japan but, I like to use the traditional kimono as a guide. 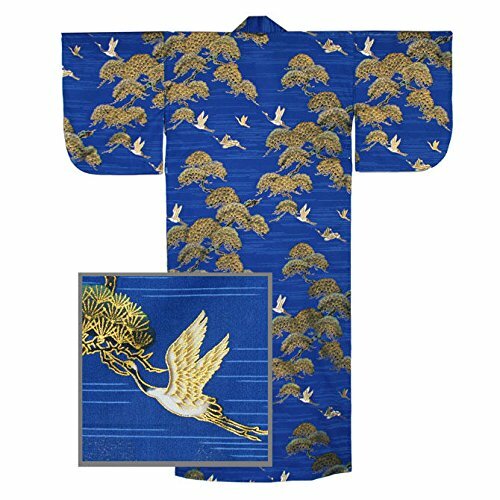 Ideally, the kimono would be silk with crane motif but, let me tell you, finding a silk kimono with a crane motif would be super expensive. I have either made my kimono or bought mine second hand. Clan mon: You would get bonus points if you have your clan and family mon visible somewhere. The family mon could be worn over the left shoulder so one's ancestors were closer to their heart, or over the right shoulder so they could guide their sword arm. The clan mon could be worn on the back, and the family mon on one of the sleeves. A samurai usually incorporated their clan colors into his formal clothing. The mon was typically done in a combination of two colors: a dark, and a light.If you're a courtier of the Doji Courtier school then show that! Judges love that! Why do I say that? 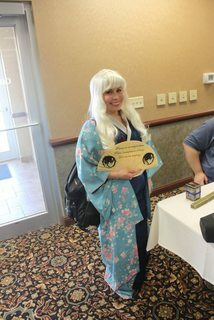 I've judged kotei costume honor events as well as was the head judge of the GenCon l5R Costume Event in 2014. Hair: Yes, members of the Crane Clan are known for white hair but, not all Crane Clan members of the samurai class have white hair. There have been a number of Crane Clan samurai who have had natural black/brown hair. 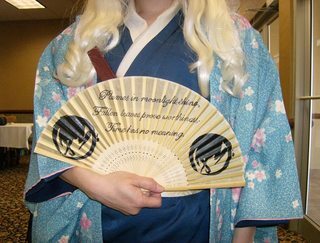 Though, a vast number of Crane Clan courtier have white hair so to be safe and if you're cosplaying a courtier wear a white wig. For bushi: Katana... don't forget your katana. ONE LAST PIECE OF ADVICE: COSPLAY IS MEANT TO BE FUN! DON'T STRESS YOURSELF OUT! Here are some of my Crane inspired cosplay. They were from a couple of years ago. They're not as perfect as I believe they ought to be. ... I know, I know, Perfection is a Dark Virture. Nebraska 2012 - Doji Magistrate visiting Crab lands with a hand written writ. 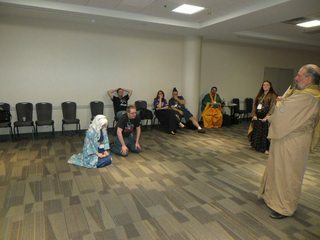 For those wondering about Sadane, I did get into a game of Sadane at Origins 2015. It was between I (the Crane Clan Head Delegate) and the Unicorn Head Delegate (Utaku Battle Maiden). Don't be afraid to get your sass on!